2005 marked the 100th anniversary of one of Red Deer’s oldest neighbourhoods – Woodlea – which lies north of Ross Street and south of 55th Street, with Waskasoo Creek on the west and the base of the East (Michener) Hill on the east. In pre-settlement times, Woodlea was one of the most fertile parts of the Red Deer River valley. It was covered with thick grasslands, interspersed with willow bunches and aspen poplar groves. The area was also rich with wildlife. One early, and most likely exaggerated, story concerns the early Methodist missionary, John McDougall. He wrote that he came across an immense herd of buffalo grazing on the flats. He stated that the herd was so dense, that he had to frequently dismount from his horse to move the calves out of the way. That the mother bison would have allowed him to do so is very doubtful, but the claim that there was a very large herd on the flats is probably true. The richness of the area attracted Reverend Leonard Gaetz and his family to the area in the spring of 1884. Rev. 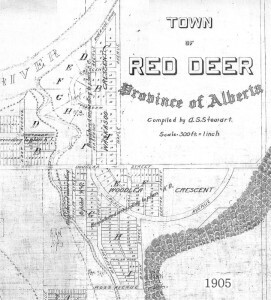 Gaetz chose the quarter section where downtown Red Deer is now located as his homestead. He chose the quarter to the east as his preemption. In 1890, Leonard Gaetz struck a deal with the Calgary-Edmonton Railway Company to give them a 50% share in the western part of his homestead for the rail line and townsite. The eastern part continued to be part of the farm. The property was also registered in the name of Leonard’s second oldest son, Halley. In the years following the turn of the century, Red Deer began to grow very rapidly. The population jumped from a mere 323 in 1901 to more than 1500 within four years. Red Deer began to extend beyond the boundaries of the original townsite. Leonard and Halley consequently decided to develop the Woodlea area as a new subdivision. The district was to have larger and longer lots than in other areas of the City. Also, Woodlea was to be the first subdivision in Red Deer where the streets and avenues varied from the standard rectangular pattern. In particular, there was to be a Woodlea Crescent and a Circle Street. The new subdivision proved to be very popular. Sales of the lots were brisk. The first homes were soon built near Waskasoo Creek on Waskasoo (45th) Avenue and Poplar (46th) Avenue. Tragically, Leonard Gaetz did not have much of a chance to enjoy the financial benefits of this real estate venture. The death of his wife Caroline on Christmas Day 1906 was a hard blow. With his health and spirit broken, he passed away in June 1907. The following years saw the construction of several more homes. The most impressive was built by Tom and Edith Ellis on the south-east corner of Poplar (46th) Avenue and Douglas (55th) Street. The Ellis’s were the owners of the Arlington Hotel; at that time the finest hotel establishment in Red Deer. During the great real estate boom of 1912-1913, many more fine and impressive homes were built, particularly along Bank Street (44th Avenue) at the foot of the hill and along Waskasoo (45th) Avenue, looking westwards towards the creek and the downtown core. In 1914, the First World War broke out. Growth in Red Deer came to a screeching halt. Woodlea became a quiet “urban fringe” area, with large open spaces. One such space became the Choate dairy farm. In 1925, the Nazarene Church bought a large piece of land in east Woodlea and turned it into a church camp for revival meetings and summer holidays. In the 1930’s, a Chinese Market Garden was established on the most easterly portion of the subdivision. In the late 1940’s and early 1950’s, the Chinese Market Garden moved to Mountview and the Nazarene Camp property was sold and subdivided into residential lots. Much of what we currently know as Woodlea was developed at that time. Today, Woodlea remains one of the most attractive and popular subdivisions in Red Deer. Originally published by the Red Deer Express. Used with permission.